Just like the Lego film, everything appears to be "awesome" at the plastic brick maker as it returned to growth again last year. "We set out with one aim in 2018, to stabilise the business," said chief executive Niels Christiansen. "Our underlying mission - what the family [which owns the business] wants - is to get Lego out to as many kids as possible," he said. Its growth in market share in all major markets comes at time when toy retailers have been struggling, illustrated by the collapse of Toys R US. This reduces outlets for sales of Lego, which is the world's biggest toymaker when measured by sales. Mr Christiansen, chief executive of the Danish brick-maker for 18 months, said he would not be seeking "supra-natural" growth rates of the past. The company is still owned by the family of Kirk Kristiansen, who founded Lego in 1932. It takes its name from an abbreviation of the two Danish words "leg godt", meaning "play well". It had achieved double-digit growth for five years until 2017, when the company said it needed a "reset" and cut 1,400 jobs worldwide. Sales in 2017 had been hit because it had "too much" stock in warehouses and shops. Mr Christiansen said Lego was combining physical and digital play. "Kids can jump between playing physically and digitally," he told the BBC. The company is expanding in China, adding 80 stores this year to the existing 60. A new flagship store was opened in Beijing earlier this month and China, with 270 million children, was an ideal place to expand, he said. 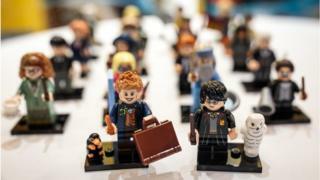 "A lot of the focus in China is education," Mr Christiansen said, and families willing to spend on toys like Lego which "build skills like collaboration". In 2018, sales in the US and Western Europe grew in low-single digits, while in China they showed double-digit growth. Mr Christiansen said there was still scope for growth in developed markets, as there were "lots of kids who haven't played with Lego". The company has pledged to use sustainable materials in its products and packaging by 2030 and Mr Christiansen said the company's issue was not about plastic disposal. "No one throws their bricks in the ocean," he said. The bricks - it sells 75 billion annually in over 140 countries - and kits are manufactured in five countries - Mexico, China, the Czech Republic, Hungary and Denmark. Mr Christiansen said the company was "taking some precautions" against the impact on its UK business from Brexit, but declined to elaborate.